Please expect to arrive ten (10) minutes prior to your scheduled appointment. If you plan to be later than fifteen (15) minutes, please call and reschedule. *For more information, please see our Appointment Cancellation Policy. Walk-in clients are welcome, however, appointments are preferred. Emergency cases receive top priority followed by clients with previously scheduled appointments. For your protection, and that of others, all dogs must be on a leash and properly controlled while in the waiting area or exam rooms. We recommend walking your dog before taking him/her in your car. A few days before your scheduled visit (preferably 1 week), take your carrier out of storage and place it near your cat’s feeding area. Next, leave the carrier door open and put your cat’s favorite blanket and some toys in the carrier so it becomes a familiar part of your cat’s environment. After some time, place some of its favorite foods inside or on top of the carrier. Because the next stressful event for many cats is simply traveling in your car, which always means a visit to the vet clinic, minimize your cat’s fear by taking it for a couple of short rides before the day of your visit. Another helpful alternative would be applying products such as the Feliway spray to the carrier 30 minutes to an hour prior your arrival. Feliway pheromones can help reduce the signs of stress your cat may be feeling while at the hospital. ***For more information, please visit our FEAR FREE link here. Unfortunately, like other medical practices, we also have the occasional late arrival or no-show appointment. We do try and manage these as apart from impacting on those who have arrived on time for their appointment; it has a negative impact on the medical team. Often there are cases being treated in hospital and the staff attempts to schedule their day to ensure that they can meet the needs of those patients and scheduled appointments. Arriving late or not showing at all impacts on their ability to manage treatments for these pets. Thus, we do have a few rules and guidelines that the staff work with in terms of late arrivals, cancellations and no-shows. Please be aware that our hospital has a policy wherein if you are more than 15 minutes late for your scheduled appointment time, we will be adjusting our schedule and moving you to the walk in/urgent care service when you arrive. While we certainly understand that delays may happen, we feel we have an obligation and responsibility to do our very best to service clients and patients who are here for their appointments on time. We strongly encourage all our clients to arrive at least 15 minutes early for scheduled appointments if possible, as we do have administrative paperwork that will need to be completed, especially if you are a new client or have a new pet. When you schedule an appointment, and fail to show or call and notify us of your inability to keep this appointment time, it impacts our ability to service clients who may be here already waiting to see a doctor. If you fail to show or call and notify us about difficulty in keeping your appointment time in more than three (3) occasions, you will be prohibited from scheduling an appointment with our medical staff. We will still see your pet, but it will be as a walk in/urgent care arrival only following three subsequent no-shows for appointments. We recognize that your pet may need medical attention and we do not wish to turn your pet away, but you will be subject to any wait times associated with the walk in/urgent care service. You must cancel an appointment we ask for 24 hours’ notice without being financially responsible for the time. For dental or surgical appointments, we ask for a 48 hours’ notice. The following fees will be applied to your account for not calling as required. This also applies to all service included in your Wellness Plan, even if they are covered 100%. 1st Missed Appointment – Our staff will call to ensure the wellbeing of you and your pet in addition to rescheduling your exam. 3rd & Subsequent Missed Appointment – a $52.50 fee will be applied to your account for canceling an appointment a 3rd time and every subsequent time with less than a 24 hours’ notice. For a Dental or Surgical procedure – a $52.50 fee will be applied to your account for canceling an appointment with less than a 48 hours’ notice. 50% of the cost of the scheduled appointment will be applied to your account for canceling an appointment with less than a 24 hours’ notice. A missed appointment fee will need to be paid prior to receiving any new services, prescriptions, or food. Missing three (3) consecutive appointments or frequent cancellations/schedule changes will result in prepayment of your appointment. We thank you in advance for abiding by these policies and helping us keep our clients, staff, and patients on schedule and safe! Please understand that we have created this policy out of respect for those clients who are waiting to have their pets be seen. Our goal is to serve you and your pet in every way possible. This includes ensuring your medical team provides the level of care that fits within your budget. It’s important that your financial commitment and responsibilities are made clear before treatment begins. In the case of an emergency, your pet will be stabilized before your medical options are presented. Payment, in full, is required at the time services are rendered. Feel free to ask for an estimate of charges at any time. If your pet is admitted to the hospital, the veterinarian will ask you to leave a deposit (usually 50% of the estimated treatment charges). Moreover, the veterinarian and nurse will provide a treatment plan and estimate for these hospitalized patients. In order to provide you with the highest level of customer service, such as to receive important notifications regarding your pet’s health (i.e. care reminders), it is vital that you keep our team notified of changes to any of your contact information. This includes email address, mail address, and correct mobile numbers (i.e. text messages for appointment reminders). Please also make sure to provide us with alternate contact information, and that way guarantee the message will be delivered. If for any reason an auto payment is declined, a late fee of $25 will be charged for each seven (7) days the payment is late. Del Mar can refuse care and services until the account is brought up to date. After 30 days of nonpayment, the monthly payment clause of the contract becomes void and the total amount becomes due. After 35 days of nonpayment, or if the credit card on file is cancelled, the account will be sent to collections for the full amount of the contract plus applicable late charges. The client shall pay for all legal or professional fees associated with collection. It is our Hospital Policy not to accept new patients outside of our normal business hours. 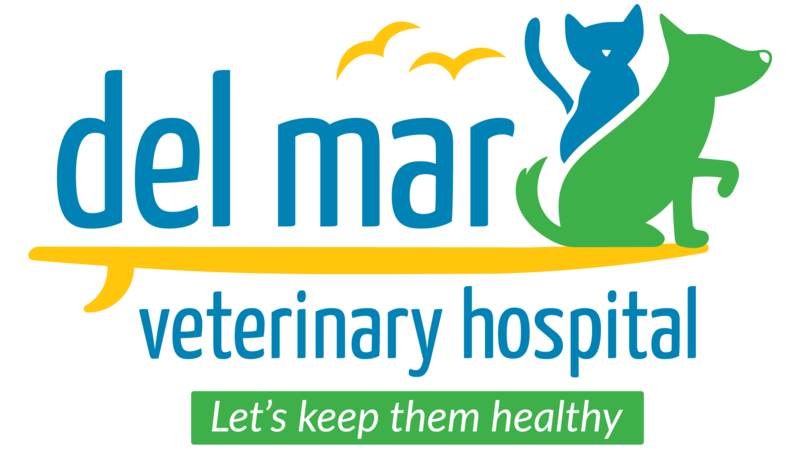 However, if your pet is a current patient of Del Mar Veterinary Hospital and an emergency should arise after hours, you may contact us via email at contact@delmarvethospital.com, and be directed to Dr. Nieves. Please keep in mind, there are additional fees associated with any after-hours emergency services. We accept Cash, Debit Cards, Visa, MasterCard, Discover, American Express and Care Credit.